2.1 Habitat. Were to find holm oaks? 2.6 How can holm oaks stand cold in winter? 2.7 What advantages has the holm oak with its perennial leaves with respect to other trees with deciduous leaves? Common English name: Holm oak, evergreen oak. – Spanish: Encina, carrasca, sardón, lecinera. – Basoue/ euskera: arte, eskurrtze, abarra, zuhaitza. Scientific name: Quercus ilex L. = Quercus smilax L. = Quercus sempervirens M. ill. The name of the genus “Quercus” comes probably from Celtic and is a compound word composed of two Celtic names: “Quer” = elegant and “Bake” = tree. The species name “Ilex” is the Latin name for oak. Habitat. Were to find holm oaks? Holm oak tree is the most typical tree of the Mediterranean climate, with the largest population throughout the Iberian Peninsula, especially in Spain, not being so widespread in Portugal, which is much richer in a very similar species, cork oak (Quercus suber). However, it can be found throughout the Mediterranean region (entire Mediterranean coast of France, Italy, Croatia, Montenegro, Albania, Greece and Turkey. 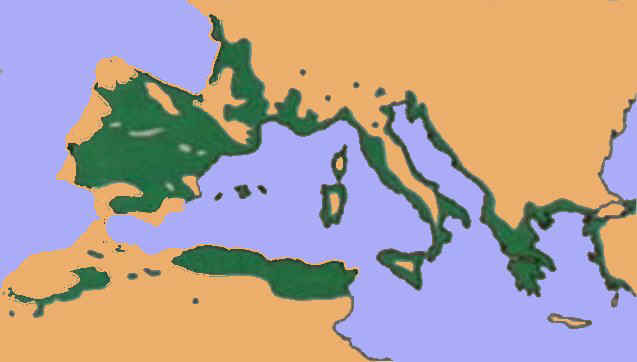 Within the Mediterranean Sea it appears in the Balearic Islands, Sicily, Corsica and Sardinia. To the north of Africa it is part of the Atlas Mountains in Morocco. Also spread throughout southern and central France to reach the west, where it grows on the French Atlantic from the department of the Gironde to the department of Morbihan). The following image gives us the distribution of holm oak in all its subspecies along the Mediterranean, as offered by Mercedes García Antón, Rafael Escribano Bowler and Costa Tenorio in his wonderful book “The Iberian forests” where this tree is discussed in depth along with many other species of the Iberian Peninsula. Evergreen tree of the fagaceae family of up to 20 M.
Turgid stem, of gray color, short and winding. Yellowish flowers, gathered in inflorescences in the form of catkins hanging from the tender shoots of the year. Fruit in nucule, (which is called acorn), dark brown at maturity, bitter, inedible, 1 to 3 cm in length, with the dome that is less than its half. In humid Mediterranean forests, forming holm oaks woods. Holm oak constitutes the Mediterranean tree par excellence. This plant is extensively illustrated as an adaptated species to the Mediterranean sclerophyllous forest. The word sclerophyllous comes from the Greek (“Skleros”= hard, “phyllon”= leaf) and refers to the type of Mediterranean vegetation with small, hard leaves. This type of leaf, present on most trees and shrubs in this climate, it is capable of withstanding the heat and the lack of rainfall during the summer, and cold in winter. The oak is an evergreen tree that has characteristics of Mediterranean sclerophyllous forest. The leaf surface is small and it is covered with wax products that produce its textured and hard leaf cuticle, which is called sclerophyllous leaf. These hard layers formed by the great development of sclerenchymatic tissue, rich in lignin, reduce water evaporation. Similarly, the stomata, located on the underside of the leaf and adequately protected by a mass of whitish hairs allows less water loss. We have to bear in mind that this tree closes the stomata of the leaves when water resources are poor. So the holm oak leaves are virtually non-functional in unfavorable conditions. There is evidence that, as summer arrives, holm oaks do most of the photosynthesis during the early hours of the morning and late afternoon when the sun is not too intense. Later, when hotter, they just close their stomata and photosynthetic activity occurs. Unlike the leaves of deciduous species, such as beech and chestnut, the leaves are not arranged in a horizontal position to capture more sunlight, but many of them lie obliquely to the direction of light to receive less solar radiation. These characteristics of size, shape, composition and distribution reflect a dual function: to protect the tree from dehydration in summer when the Mediterranean forest is very hot and water is not abundant and protect the leaves from the cold winter. How can holm oaks stand cold in winter? Holm oak is an evergreen tree. Although it does not drop the leaves when the autumn arrives, it achieves the same purpose than a beech or a chestnut, which have no leaves during the winter. The oak, even with leaves during the winter, remains inactive during this season to withstand the strong cold in winter. To do this, as autumn progresses, it ceases its activity remaining virtually idle from 0 ° C.
This inactivity, together with the presence of waxy coatings and other substances from its body, make it withstand temperatures well below 0 º C. Quercus ilex L. subspecies subsp. = Quercus ilex rotundifolia L. subsp. ballota, known as Portuguese oak, living in inland areas, can resist up to -25 ° C.
What advantages has the holm oak with its perennial leaves with respect to other trees with deciduous leaves? The main advantage is a higher nutrient economy. A beech needs to renew all its leaves every year. Building all the foliage of a tree like a holm oak would represent too great an effort for a tree that does not have many resources at their disposal to achieve this, primarily adequate water. An oak tree can take advantage of favorable times of so variable Mediterranean climate without risking so much in return as it does have a much more predictable climate, especially in regard to water availability. These are the reasons why the sclerophyllous Mediterranean climate plants, such as holm oak, tend to have small and perennial leaves, while in wet and cold climates tend to be larger and deciduous. The evergreen leaves are small and with an adaptation to an environment with strong solar radiation, to save water and not to suffer so much when renewing the leaves in the early spring. (More information on adaptations of leaves). Holm oak in its variety of Portuguese oak (Quercus ilex L. subsp. rotundifolia) represents the typical figure of the grassland of the Iberian Peninsula. This grassland, (called “dehesa” in Spanish) is a type of landscape constituted by a grass field with a spread of trees like holm oak, cork oak, oak and, sometimes pine. It constitutes a evolution of the primitive Mediterranean holm oak woods, which used to cover about one third of wooded terrain of the Iberian Peninsula. Quercus ilex L. subsp. ilex: It’s the variety that is located in coastal areas from sea level to over 1500 meters. Properly known as holm oak. It is a type of holm oak that needs more moisture (600 liters per year minimum) and that does not support the continental climates. It differs from the continental variety because it has a more narrow and upright, elongated leaves, less hairy underside. Honey Oak (Quercus ariifolia): a tree that grows in the southwest U.S. and northern Mexico. reaches a height of about 12 or 20 feet and can live in very dry or very wet, from 1000 meters to above 2500 meters. Mexican red oak (Quercus affinis): Mexican species that reaches about 20 or 30 meters. It grows in temperate or semi between 1000 and 3000 meters, especially in Sierra Madre. Widely used in making tool handles and fuel. The species with which it is more possible to confuse it is Kermes oak (Quercus coccifera). Kermes oak is another member of the same family that is very similar, especially when oaks or holm oaks are small and have sharp leaves, similar to those of kermes oak. It is a shrub that has smaller leaves, twisted and sharp, even when adult. 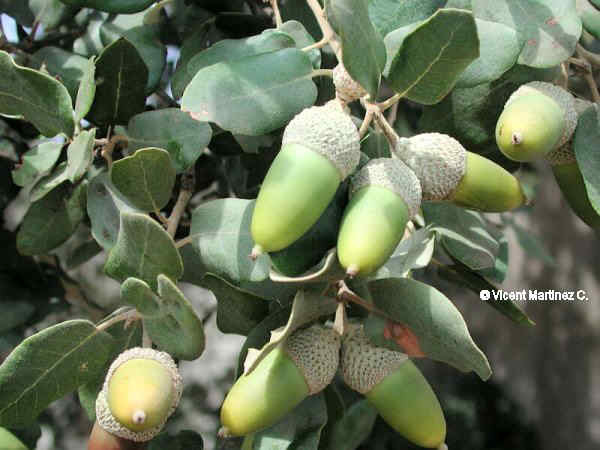 The fruit of Kermes is also an acorn, though it differs from the holm oak because it has a cap that covers half of the fruit and it is covered with sharp scales. In the holm oak, this cap reaches only a third of the length of the fruit and has no sharp scales. Kermes oak is the most characteristic plant of a type of vegetation called Mediterranean “garriga” , but may appear mixed with the holm oaks in holm oak degraded woodlands. Another species with which it is possible to be confused, if one only pays attention to the leaves and the acorns, is the cork oak (Quercus suber) but it is sufficient to check the thick bark (cork) that covers the trunk and its branches to realize the difference. Oaks (Quercus pubescens, Quercus robur, Quercus pyrenaica , Quercus lusitanica, etc) also present the same type of fruit (Acorns) although the shape of their leaves quickly distinguishes them from holm oaks. Holly is a shrub lower than the oak and the fruit is completely different since, in holly, the fruit has the shape of a red ball and do not produce acorns. It belongs to a different family (Aquifoliaceae). Holly can appear with the holm oak tree in a mixed vegetation. The coastal oak (Quercus ilex L. subsp. ilex) forms pure forests in the Mediterranean coastal areas where oaks can live with a related species, cork oak, and a number of plants of this type of forest. There are also mixed holm oak forests where this tree is mixed with other, like pine or oak. It can grow into any type of terrain, except for those with poor drainage or saline nature, but prefers fertile soil, deep and of loamy nature. It accepts sandy soils without problems. It needs sunny sites, but tolerates shade quite well when young. It is very resistant to sea winds, cold and heat. It can be very decorative in a garden or square, although its growth is very slow. Production of coal and firewood:The wood of the holm oak is well suited to start a fire as it provides much heat and burns for very long. It has been used and is still being used as fuel for stoves and fireplaces in many sites in the Mediterranean. It was also used for charcoal production. This resulted in the past the decline of many holm oaks that were reduced in size or density. However, proper planning of the operation of the holm oaks may allow the use of this wood in the production of firewood. Enough for it would be to utilize the scrap wood from annual pruning. This production can extend for hundreds of years. It is estimated that the average life of the Spanish holm oaks currently stands at around 400 years. Wood Production: Holm oak has a very hard and durable wood. Stands up weight and moisture very well. Although it is difficult to work, it is very decorative in woodturning. However, since it is a tree that grows very slowly, it is not widely used for these purposes. Production of tools: Given the strength and the ability to resist moisture and rotting, the wood of the oak has been used traditionally for the development of tools for the field, such as handles or plowshares, handles for hoes, wagon wheels, spare wheel of the wells, fence posts, etc. Tannin production: The industry uses the tannins obtained from bark and galls, mainly in the treatment of skins and paintings. The oak galls are ballshaped growths that cause these trees to accommodate the woodeating insects, so they do not attack the real tree branches. The insects live inside these galls in the larval stage. When you go abroad become punching the guts them and let them free. These galls are rich in tannins and dyes. Food for the pigs: The fruits of the oak and acorns are used to feed pigs. With them, the famous Iberian pigs producing hams are fed. So this type of ham that comes from pigs fed on acorns in the pastures is also called “acornfed Iberian ham”. Its quality is very high because the fatty richness of the hold oak fruit gives it less fat than ham produced from pigs fed with fodder. Besides, the taste has a special flavor that makes it recognizable and appreciated worldwide. Its price, of course, is much higher than the regular cured ham. Food for people: The acorns that holm oaks produce are sweeter than those produced by oaks. Within the acorns of holm oaks, some are especially sweet and are used as food, although one does not have to abuse them because they contain many tannins that can produce intestinal disorders. More information on holm oak.